On a beautiful crisp winters morning, we set off for Chez Julien, along the Seine, Paris. We’re wrapped up just like the chap from Aerosmith with 17 scarves each. We’ve cocooned ourselves from the winter chill, it’s the kind of chill that startles you and reminds you you’re alive, for now, but maybe not for long. We meandered through the 16th arrondissement, down the Champs through the 8th to the 9th where we decided to take a peek inside the Palais Garnier. The 1875 masterpiece designed by architect Charles Garnier is a stunning example of opulence and extravagance. After a magical hour or so taking in the opera house we emerged into a rainy, overcast but beautiful Paris and make our way to Chez Julien in the Marais. Huddling under our brollies we know we must be getting close as we get nearer the Seine. Then there it is, yes I think this is it. Pretty as a picture under its deep awning, Chez Julien is immediately enticing. It feels, warm and welcoming with a whimsical and romantic sensibility. 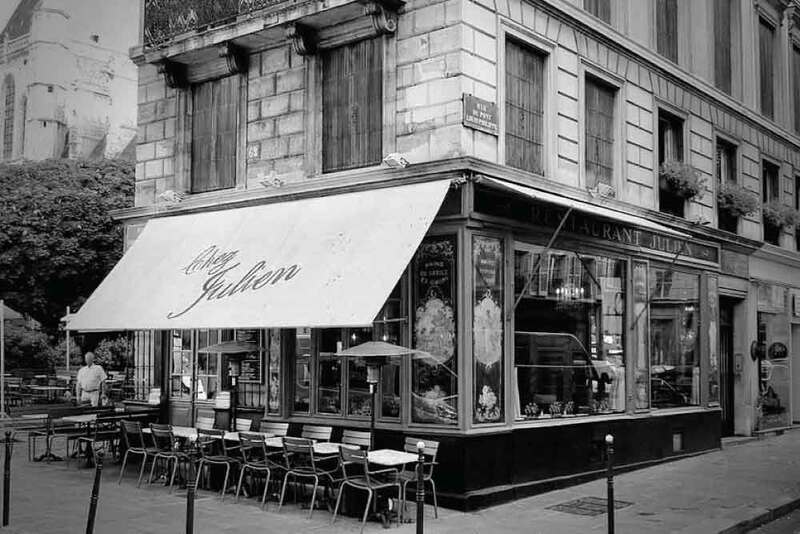 Chez Julien has been part of the quartier historique, Le Marais, since its establishment in 1780. We are shown to a lovely corner seat in the window at the back of the restaurant, it’s a cosy spot requiring the Paris table two step shuffle. Once we are settled it’s a perfect position to enjoy taking in the atmosphere of the place. It’s a very feminine space, that makes me feel more feminine in it and compels me to frequently check my lipstick in one of the many mirrors that surround us. Apparently the décor is of the Belle Époque period, a time of peace, prosperity and innovation. A time in Paris when the arts flourished. I love all the little details, soft lilac wallpaper with an intricate raised pattern, beautiful intricate painted ceilings, red velvet upholstery. Even the chains and wires suspending the sparkling chandeliers are covered with delicately arranged ribbons to prettify them. The menu is just the sort of menu I like, simple, a few things done well. Good honest classique Paris bistro food. I have spotted the standouts for me and made my selection. My love enjoys asking the staff in restaurants for their recommendations, a great thing to do in non-touristy places because you will usually find out what the locals order most. I usually wait to hear the waiter’s explanation and often end up changing my mind on what I thought I was going to order. This time voila! The waiter agrees with me. Langoustine for entrée and Chateaubriand sauce aux poivres, frites maison (steak and chips with pepper sauce) for main. While we wait for our meal we sip a lovely Pouilly Fume and watch the reflection of Paris captured by the large mottled gold framed mirrors that line the inside walls. It’s a wonderful effect like being inside a kaleidoscope, mirrors reflecting mirrors, reflecting windows, reflecting light from chandeliers. As I watch the rain and the wind I am grateful to be inside, warm and cosy. I figured out that our kitchen is downstairs; I’ve spotted what looks to be our starters levitating at the first step. Our waiter, who is doing a fantastic job running front of house alone and never missing a beat, swoops down and retrieves the two plates and with a clearly well practiced swivel on his heel, heads our way. Our langoustine arrives wrapped in shredded filo pastry, fried and surrounded by a gorgeously light foamed bisque. Simple but delicious, the bisque the perfect balancer for the dish and it is a very generous portion for a starter. Hungry from our long walk we make short work of the crispy seafood sensation. Our steak is a simple looking dish but we can see as soon the plate lands that is an exceptional piece of beef. At least two inches thick the meat is well caramelised and yes there is a god, a proper crusty sprinkle of thickly ground salt is the only accoutrement. The Frits de Maison are classic French fries and plentiful and there is a little pot of pepper sauce on the side. Now for the big test, cutting into that thick steak to see if it’s cooked correctly. Amazing, for me there is always something unbeatable about a good piece of meat cooked simply and well. Perfection, the meat is seared on the outside but pink moist and delicious inside. It’s obviously well rested, there are no running juices, all that moisture and tenderness has been retained in the meat. The meat has a wonderful flavour and stands up just as it comes with that yummy salty top layer. The sauce is very good, strong, peppery and creamy. I’m wondering if perhaps the pan was deglazed with whiskey for the sauce? Wanting to celebrate good produce in the magnificent beef we lean toward using the sauce for our frites. I am always fascinated by how different people approach a dining experience and part of the fun of a restaurant visit is indulging in a little voyeurism. Today has provided an interesting contrast. A lovely French family with two small children are across the way. The little ones are presented with the same huge steak and chips dish that we ordered. They tuck in, impeccable table manners, using their giant French chainsaw knives to slice off big slices of pink rare beef, devouring it with great focus and enjoyment. While I don’t speak French, it seems to me that the little ones are sharing their enjoyment of the food with each other making yum yum noises as they eat and chatting and pointing at their plates between mouthfuls. I just think it’s a fantastic thing that children are given the opportunity to eat and learn to appreciate, good food. Gorgeous. On the opposite end of the spectrum a non-French (American) couple. He seems excited to order a meal, his partner however seems inconvenienced to be dining in Le Bistro, therefore she will only take Evian merci, as she shrieks, “You know I won’t be eating here!” He appears un-phased, orders his 3 courses with excitement and tucks in with great gusto when it arrives. He’s a huge towering chap so perhaps he’ll whisk her off to Hotel Costes later and have another go! We opt for shared dessert today, Crème brûlée one of my all-time favourite desserts. It is presented in a wide shallow pottery dish, paper thin slices of pear decorate the top, all brûléed to a crisp golden toffee. A very elegant finish to a lovely meal.